Width: 15 1/8", Height: 14 1/2", Depth: 8 1/2"
Founded by premium leather and accessories designer, Edmond Chesneau, Luxury Leather Africa (LULEA) is an enterprise for social impact. 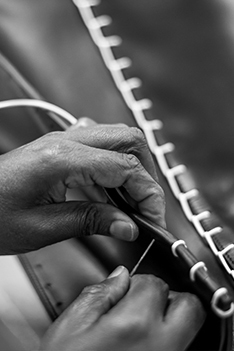 Based in Thika, Kenya, LULEA specializes in training workers to be masters in the creation of luxury leather goods of outstanding quality for the global market by a sustained training approach. LULEA won an Ethical Fashion award at the House of Lords in London in 2013. Another award was received from the Kenyan Ministry of Industrialisation in 2014 for its contribution to the East African leather industry. EDUN has collaborated with LULEA for 3 seasons to develop all of the leather goods collection in Kenya.